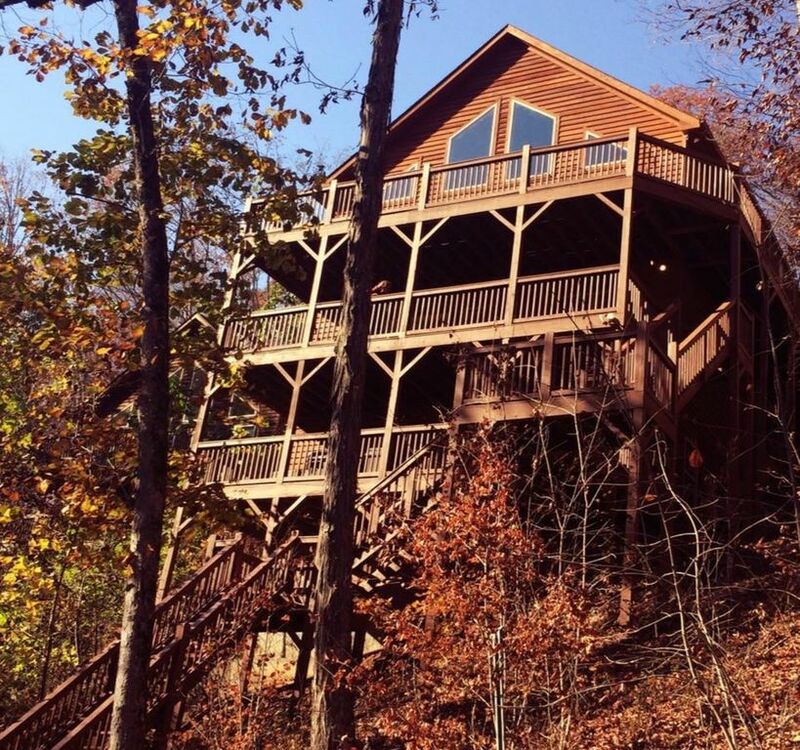 "Good Company" at Norris Lake is a 3800sq ft lakefront cabin boasting 8 bedrooms, 4 bathrooms, 2 living rooms, and a game room. Enjoy the fresh mountain air on one of our 3 decks, or relax and rejuvenate in our outdoor hot tub. You'll have private access to the lake and dock--just minutes from Sugar Hollow Marina and the notorious "jump bridge." And if lake water doesn't float your boat, you also have the option of swimming in the Lakeside Estates community swimming pool. From board games to billiards, shuffleboard to corn hole, there's fun for the whole family. Come make lasting memories with Good Company! Every year our family gets together for a week. In the summer of 2015, I, along with 15 of my favorite aunts, uncles, and cousins, rented a house on Norris Lake. Every one of us was in awe of the vibrant tropical color of the water--color we'd only seen in some of the most exotic corners of the earth. As we tooled around the lake, we saw a "for sale" sign on a house...and so it began. What started as a joke, soon became a reality. Nine of us joined together to invest in our futures and the futures of our children. The idea was to have a place we could go to reunite with our family and friends--to continue to build lasting memories and create that opportunity for others. We looked at numerous properties, but none of them offered the cabin feel that "Good Company" has. The views are exquisite! The tranquility and serenity--the trees, the mountains, the water....it's all breathtaking. Great cabin. Well stocked in the kitchen and very clean. We most loved the fire pit!! Good Company, Even Better Lodging! For the second year in a row, we celebrated New Year's at Good Company with a group of 15 friends. We had fewer people this year and the cabin felt huge! Nobody had to share a room and there were more than enough towels to go around. We absolutely love the variety of gathering areas: Hot Tub, Game Room, Kitchen/Living Room, Shuffleboard Room. At any given time, there were at least 3 groups hanging around different parts of the cabin and we never felt crowded. Since it was winter, we didn't make use of the lake, although we did try to fish before we broke the only rod we brought. Bring with you: paper towels, trash bags, toilet paper - a few of these are provided, but for longer than a weekend, you'll need more. If you want to do laundry, there is a brand new w/d, just bring detergent. There are two coffee pots, bring your coffee! There's also a large crockpot, cutting board, electric griddle, and a small blender provided! Great cabin, beautiful location, wonderful owners, what are you waiting for!? Thanks so much for the review. We really appreciate you guys taking such great care of the place. I hope you all had a wonderful New Year's, and we look forward to having you back as soon as you're ready! My children and grandchildren and mother get together the day after Christmas and spend a few days together. We live in different places and this was close to the middle for everyone. The house was clean. The weather was perfect a little rain, so we enjoyed the hot tub, fire pit. we spent a lot of time playing corn hole. The lighting was nice at the fire pit. We enjoyed our stay. Needed more sheets and blankets for the couch beds, we had teenagers that wanted to sleep on couch beds so they could watch TV all night. We would definitely stay at the house again. Perfect for family gatherings. Thank you for your wonderful hospitality, Mike and Candace! We had a family reunion at Good Company for Christmas. The house was perfect for our large group. We occupied all 8 bedrooms. Mike and Candace were kind enough to put up a Christmas Tree for us, which really meant a lot for the kids. The kitchen is very well equipped and the two fridges made a huge difference. We were able to seat our entire group for family meals. The fire pit was an amazing touch for make smore's on Christmas Eve! We would love to return during the summer to make use of the gorgeous lake! Thanks again Mike and Candace for a perfect gathering! The property was very nice and just what we needed for all the couples. Everything was amazing!! The owner was very responsive to us and never hesitated when we asked a million questions! The property was stocked with everything. All we needed was our food and clothes. We had a great time and very thankful to the owner for helping us plan this couples retreat. It's the perfect place for large families!! We stayed at this home because we were attending a wedding at Cove Lake State Park. The home was great...plenty of room for everyone. The house was clean and the beds and linens were all fine too. Loved the decks, the hot tub, and the kids really like the shuffleboard and board games. Having 2 fridges was also a plus. The owners were very easy and accommodating to work with! Beautiful area of Tennessee. Must be at least 25 years old to rent this property.